Noroviruses are the most common cause of gastroenteritis outbreaks in industrialised countries. Gastroenteritis caused by Norovirus infection has been described as a highly seasonal syndrome, often referred to as "winter vomiting disease". The Public Health Laboratory Service Communicable Disease Surveillance Centre has systematically collected reports of laboratory confirmed cases of Norovirus-gastroenteritis since 1995. We analysed these data for annual and seasonal trends and age distribution. A mid-summer peak in reported cases of Norovirus was observed in 2002, unlike all six previous years when there was a marked summer decline. Total reports from 2002 have also been higher than all previous years. From the first 10 months of 2002, a total of 3029 Norovirus diagnoses were reported compared the previous peak in 1996 of 2437 diagnoses for the whole 12-month period. 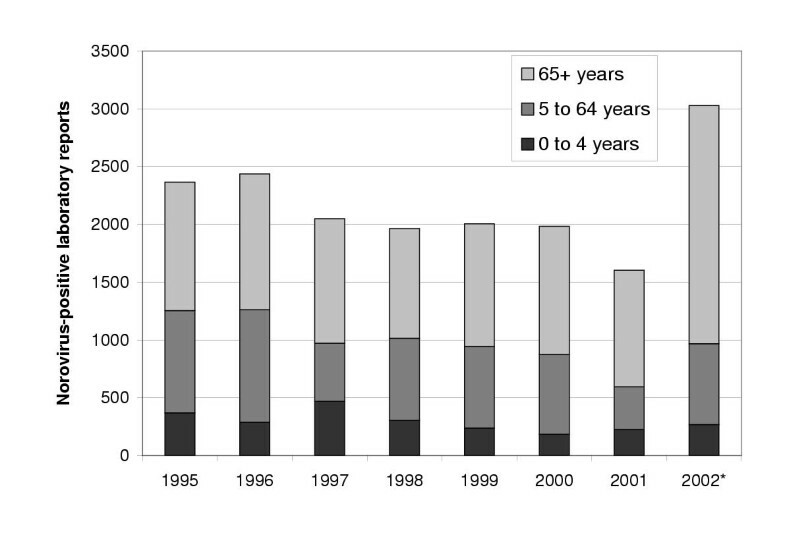 The increase in 2002 was most marked in the 65 and older age group. This surveillance data challenges the view that Noroviruses infections exclusively have wintertime seasonality. Noroviruses are the group of viruses formerly known as Norwalk-like viruses (NLV) or Small Round Structured Viruses (SRSV). These viruses have long been recognised as a cause of relatively mild gastroenteritis, often referred to as "winter vomiting disease" . While transmission does occur year-round, cases and outbreaks exhibit a cold-weather peak . Noroviruses are a leading cause of gastroenteritis in the community and are the most common cause of outbreaks in semi-closed environments such as schools, cruise ships, hospitals and residential homes . Outbreaks are difficult to control due to the high frequency of vomiting and widespread contaminations . There is increasing concern in both in the medical and popular press about the impact of Noroviruses on healthcare institutions, with over 100 articles from outbreaks appearing on the BBC News website [3, 5, 6]. Approximately 200 National Health Service laboratories and 40 public health laboratories throughout England and Wales report positive diagnostic results of gastrointestinal pathogens, including Noroviruses, to the Public Health Laboratory Service Communicable Disease Surveillance Centre (CDSC) via an electronic reporting system called LabBase . Not all laboratories have the capability to test for Noroviruses, so specimens are sent to regional or reference laboratories for analysis by electron microscopy (EM), enzyme linked immunosorbent assay (ELISA) and/or reverse transcription – polymerase chain reaction (RT-PCR). A medical microbiologist submits diagnostic reports from the source laboratory where specimens were first received for testing. This system of laboratory reporting of Norovirus-positive results to CDSC provides a consistent and timely source of trend data despite the fact that Noroviruses laboratory diagnostic reports underestimate the true incidence of infection . All electronic records from 1995 to October 2002 were downloaded from the central database. Duplicate records were removed. The software programs Microsoft Excel and STATA 6.0 (College Station, Texas) were used for analysis . 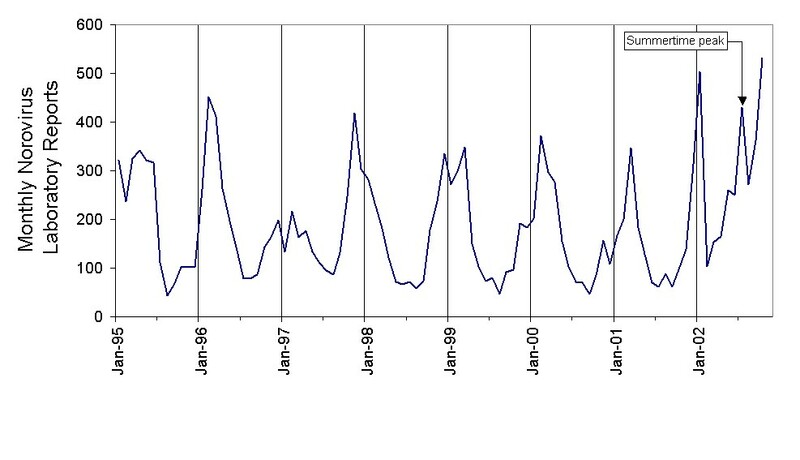 The number of Norovirus reports for each month from 1995 to October 2002 are shown in Figure 1. A total of 17,771 positive test results were reported during the surveillance period. From the first 10 months of 2002, there were a total of 3029 Norovirus reports. The previous annual peak in reporting was in 1996, when 2437 cases were reported for the whole 12-month period. The highest previous January to October figure was 2189 in 1995. In 2002, Norovirus reports did not fall during the summer months as they had in every other year in the reported period. Reports increased to a peak of 430 reports in July. Electron microscopy was the most common laboratory method used, accounting for 12031 (67.7%) reports from the surveillance period. ELISA testing was first commercially made available in March 2001 (Dako Cytomation, Ely, UK)  and was used for 12.4% (231/1861) of diagnoses in 2001 and 10.7% (324/3029) of all diagnoses in 2002. Considering only the diagnoses made by EM in 2002, reports increased from April (n = 34) to May (n = 76), and came to a summer peak in July (n = 96). From 1995 to 2001, an average of 52% of all cases were 65 years or older (Figure 2). In 2002, the number of cases in this age group was proportionately larger (68%) compared to previous years (χ2 = 259.8, p < 0.001). Norovirus laboratory reports: Age distribution of cases in England and Wales,1995 to 2002. * 2002 figures include only January to October. For the first time, a summer peak of Norovirus reports has been observed in England and Wales. This observation from summer 2002 is in contrast with a ubiquitous collection of reports that Noroviruses are principally an infection associated with the winter months [11–13]. The year 2002 also appears exceptional in terms of the total number of reports which were 38% higher when compared to 1996, the previous peak year of reporting. It should be noted that laboratory reports represent only a small fraction (estimated at approximately 1 in 315) of the actual cases of Norovirus occurring in the community . Surveillance data such as these are inevitably subject to reporting bias, especially when a syndrome becomes as prolific in the popular media as Norovirus has . Another potential bias in the surveillance period was the introduction of a commercial ELISA for the detection of Noroviruses in faecal samples in March 2001 (Dako Cytomation, Ely, UK) . Since many more laboratories have the capacity to use an ELISA diagnostic test compared to EM or RT-PCR, it is possible that the use of the ELISA could result in increased ascertainment of Noroviruses. However, it is unlikely that introduction of the ELISA explains the observed increase during this surveillance period as it was used in only 11% of diagnoses in 2002 whilst overall reports increased by 28% in 2002 compared to the previous peak in 1995 when no ELISA testing was available. Furthermore, these potential biases are unlikely to affect the seasonal pattern of laboratory reports. It should also be noted that if only EM reports are considered, an increase during the summer months of 2002 can still be observed. 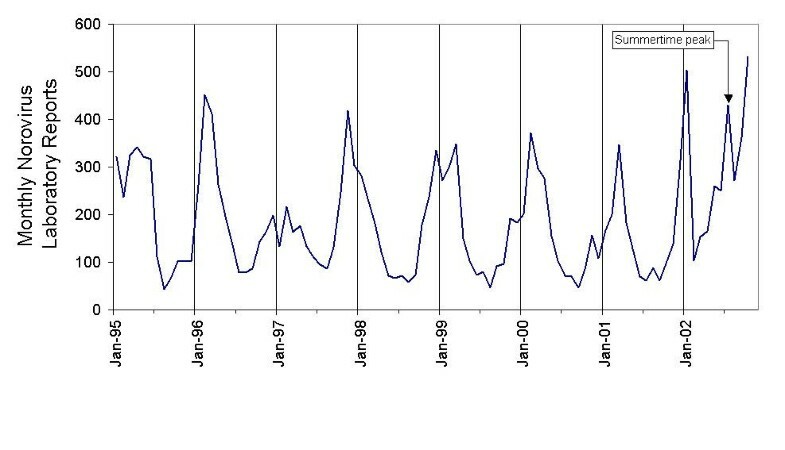 Therefore, the summertime peak in Norovirus reports in 2002 is suggestive of a true atypical pattern and not an artefact of surveillance. If the observed trend is genuine, it may be explained by the emergence a new virus variant and/or a change in ecology in the healthcare setting. However, preliminary genotyping results do not suggest the emergence of a distinct new strain this summer. A virus belonging to the Lordsdale/ Grimsby cluster of Noroviruses of genogroup II, which has been the most common strain causing disease for many years, was the predominant strain associated with hospital outbreaks in the winter and summer months of 2002, being responsible for 70 – 80% of outbreaks in both seasons  (unpublished data). The majority of the increase seen in Norovirus in 2002 was seen in the 65-plus age group. This observation is consistent with preliminary data from outbreak surveillance and media reports that there has been an increase of outbreaks in hospitals and nursing homes . Previous analysis of Norovirus outbreak data showed that over three quarters of all outbreaks reported in England and Wales occurred in healthcare institutions . Outbreak data provides the most complete epidemiological information on Noroviruses, although the reporting time lag of this system is too long to discern a clear trend yet for 2002. However, the age distribution observed in the laboratory reporting for 2002 suggests that the increase in Norovirus incidence may be focused on hospitals and nursing homes. There is mounting concern about the impact of outbreaks of Norovirus gastroenteritis on healthcare facilities. These data along with anecdotal reports, outbreak data and media stories suggest an increase in Norovirus incidents. Changes in hospital management, including bed occupancy, staffing levels and cleaning procedures may impact the introduction and subsequent spread of Noroviruses in hospitals. Specific guidelines for the control of nosocomial outbreaks of viral gastroenteritis are available . However, understanding of the epidemiology and factors associated with the spread of Norovirus outbreaks in healthcare institutions is incomplete and, therefore, studies aimed at developing more effective control are urgently needed. • For the first time, a summer-time peak of Norovirus laboratory reports has been observed in England and Wales. • In the first ten months of 2002, there were more reported cases of Norovirus than in any previous year. • The age distribution of the cases suggests that the increase is mostly seen in the elderly, where the impacts, both on individuals and the health service are most pronounced.